A trendy home & office decoration featured in Popular Mechanics, USA Today, and Wired Magazine, photo canvases make a thoughtful and creative gift. Canvas People offers the lowest price, highest quality photo to canvas printing. 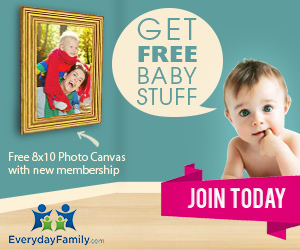 Visit Everyday Family website to request your free baby stuff today and also get a free photo on canvas from Canvas People.